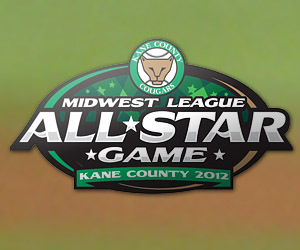 The Hot Rods announced today that a franchise high eight players have been named to the 2012 Midwest League All-Star team. The Hot Rods will be represented by Ryan Brett, Jake Floethe, Jeff Malm, Tyler Goeddel, Jake Partridge, Matt Rice, Felipe Rivero and Josh Sale. Brett is hitting .317 with 7 doubles, 3 triples, 4 homers and 16 RBI's in 46 games this season. His 15 stolen bases on the season leads the Hot Rods. Brett was drafted by the Rays in the third round of the 2010 draft. This is his first All-Star nomination. Floethe is 5-1 on the season with a 3.27 ERA and 46 strikeouts in 12 starts this season. His five wins is tied for the club lead. Drafted by the Rays in the sixth round of the 2011 draft, this will be his first all-star game. Malm is hitting .295 with 20 doubles, 3 triples, 5 home runs and 28 RBI's in 54 games this year. His offensive production places him in the top ten of most Midwest offensive stats. Malm was drafted by the Rays in the fifth round of the 2009 draft. Goeddel is hitting .267 with 9 doubles and 4 home runs while driving in 20 runs in 46 games this season. This is his first year of professional baseball after being drafted in the first round of the 2011 draft. Partridge is a perfect 4-0 with a team leading 1.37 ERA in 15 games this season. He has struck out 36 hitters in 39.1 innings on the mound this season. This is his fourth season in the organization after being drafted in the 2009 draft. Rice has been a mainstay behind the plate for the Hot Rods this season. He is hitting .287 with 3 doubles and 3 home runs in 32 games this season. He has been nominated to the all-star squad in both of his professional seasons. Rivero is 5-4 with a 2.18 ERA in 12 games this season. His 56 strikeouts leads the Hot Rods so far this season. This is his fourth year in the organization after being signed as an international free agent in 2008. Sale is making up for lost time as he leads the team in most offensive categories despite only being promoted to Bowling Green a few weeks into the season. Sale is hitting .368 with 4 doubles, a team leading 7 home runs and 18 RBI's in 20 games this season. His slugging of .807 leads the club and he is the only current player not to have committed an error. Sale was drafted by the Rays in the first round of the 2010 draft. The 2012 Midwest League All-Star Game will be held on June 19 at Fifth Third Bank Ballpark, home of the Kane County Cougars. I cant see how Vettleson was skipped over,cannon of a arm leading all of minor leagues in outfield assist,unbelievable !!! Are you kidding me Vettleson didn't make it? Sale doesn't have enough at bats to be in the game. That is crap for vettleson. Not discounting Sale because he has been unreal, but still. No Vettleson??? Unbelievable. It doesn't seem like Sale should be allowed to be on the All-Star team. Hasn't been there very long. Doesn't the Midwest League require a minimum amount of plate appearances? Very disappointed. Yeah Vettleson is a huge absence here. However, we have to be proud of the 8 guys who did make it, which validates the amazing talent we have at this level. If we could get our pitching to half of the level of Lansing, we would dominate.